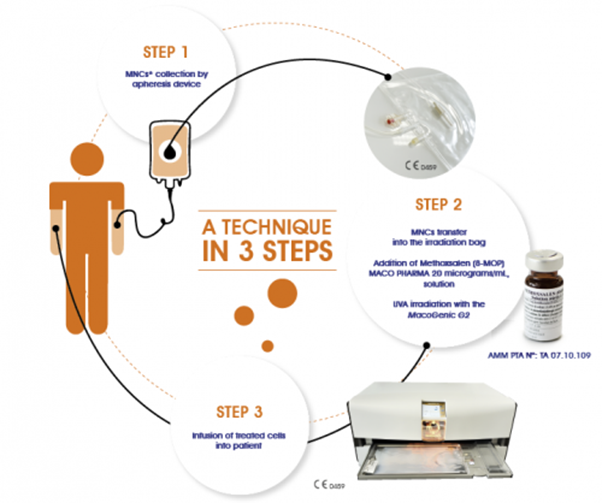 Macopharma has developed a complete product range for the off-line extracorporeal photpheresis technique. Extracorporeal photopheresis (ECP) is based on the exposure of peripheral blood mononuclear cells to the photosensitizing agent (8-methoxypsoralen or 8-MOP) and UVA irradiation. Mononuclear cells are harvested by an apheresis device usually and reinfused to the patient after cell irradiation.